The classical crossover group The Ahn Trio will close this season’s UBS Atrium Series on Wednesday, June 14 at 12:30 p.m. The concert is free. 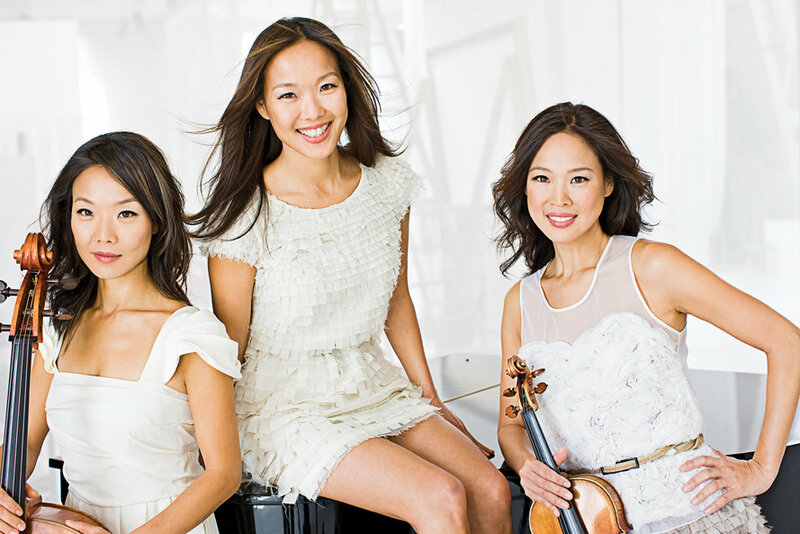 The Ahn sisters were born in Seoul, Korea, and educated at the Juilliard School in New York City. Reflecting the two cultures they grew up in, the trio brings a new energy and excitement to the chamber music world. Such noted composers as Michael Nyman, Maurice Jarre, Pat Metheny, Paul Schoenfield, Mark O’ Connor, Nikolai Kapustin, and Paul Chiara have written works for them. In two decades of touring, the trio has performed in all 50 states and in over 30 countries. They have recorded six albums for major record labels including EMI and Sony, garnering high praise and many awards. This concert will present works from their newest CD, “Blue.” Snapshots of this particular musical journey include hanging out with Prince at Paisley Park and playing “Purple Rain,” working with Pat Metheny who wrote “Yuryung” for the trio, and performing “Skylife” for President Obama at the White House. “Blue” also includes music from TEDWomen and collaborations with Juilliard classmate Kenji Bunch. Rounding out the album are the addition of new musical pictures, a collaboration with Hyung-ki Joo of Igudesman & Joo, and a D.D. Jackson arrangement of “Little Wing” by Jimi Hendrix. Dedicated to educating and inspiring the next generation of musicians, the Ahns are passionate about sharing their knowledge. Angella is a Professor of Violin and Viola at Montana State University, in Bozeman, Mont. Maria teaches cello and is the head of the String Department at the Harlem School of the Arts in NYC. Lucia has a growing private studio. They hold master classes and workshops across the United States and around the world. Whether they are performing in New York’s Lincoln Center, Vienna’s Musikverein, Buenos Aires’ Teatro Colon, or Beijing’s Concert Hall, the Ahns share their innovative spirit and ever-evolving musical vision. For directions and more information, please check the HRPAC website – www.hrpac.org – or call the concert hotline at (201) 716-4540. The Braddock Park Farmer’s Market has officially opened for business for the 2017 season. Once again it is located just inside the north entrance to the park, opposite the Veteran’s Memorial. The heart of the market is a fresh produce stand stuffed with healthy, local-sourced fruits and vegetables. Cooked food will also be available, including corn, burgers, hot dogs, and shish-kebabs. In addition, a rotating selection of vendors will bring different wares each week to the market. The Braddock Park Farmer’s Market will be open every Sunday from 10 a.m. to 2 p.m. through Oct. 1. Plenty of free parking is available. Come visit and add a healthy alternative to your diet. The Weehawken Township School District was appointed as a Trustee District of the Garden State Coalition of Schools (GSCS) at the organization’s annual meeting in Monroe, New Jersey on May 31. GSCS is the organization of New Jersey’s “lighthouse districts” who collaboratively advocate for quality public education for all of New Jersey’s children . GSCS members have served on state-level tasks forces; regularly interact with state legislators, members of the governor’s administration, and top officials in the New Jersey Department of Education; and frequently provide testimony regarding the state’s school funding formula, PARCC, school choice, and school district performance monitoring. “This is a call to further service, as well as a vote of confidence in the leadership and advocacy we have already demonstrated throughout the state on crucial issues affecting public education,” Weehawken Superintendent of Schools Dr. Robert R. Zywicki said. Weehawken Township School District was appointed to a three-year term and will work shoulder-to-shoulder with the other trustee districts appointed to three-year-terms, including The Chathams, West Windsor Plainsboro, Millburn, Glen Ridge, and Cherry Hill. Weehawken fifth grade Peer Leaders hosted a pet shelter visit to the Theodore Roosevelt School on June 2. The Peer Leaders, as in the past, built a Towel Tower filled with gently used towels, pet supplies, bagged and canned food, toys, which were presented to the shelter and their furry friends. The supplies will go towards the Bergen County Humane Enforcement, a private organization located in Bergen County that also serves Hudson County. Its goal is protecting and rescuing as many lost, unwanted, and stray domestic animals as possible. Peer Leader Facilitator Jill Barbarise also brought her dog to the event. The Bayonne Urban Enterprise Zone (UEZ) Bergen Point Art Installation Project is calling for artists to submit proposals to help transform Broadway in the Bergen Point neighborhood into an art streetscape. Artists from Hudson County interested in painting call boxes, fire boxes, statues, and wall murals, to transform street features can apply using the official RFP application at the city’s homepage at bayonnenj.org and scroll through the slideshow at the top of the page. The deadline to enter is Friday, June 23. After seeing the long-term success of the streetscapes on Central Avenue in Special in the Jersey City Heights SID, which started in 2009, Bayonne allocated $60,000 of UEZ funds to facilitate an initiative of its own, with the coordination of new local art spot, The Bridge Art Gallery, and the Hudson County Office of Cultural and Heritage Affairs. The initiative will not only to beautify the shopping district, but attract visitors, renew old streetscapes, and prevent vandalism. Weathered, old, and otherwise boring traffic boxes and the sides of buildings are intended to become eye candy instead of eyesores. The upgrading of Bayonne’s streetscapes will take place in one of 27 designated Urban Enterprise Zone across the state, which were instituted in 1983, and their main draw is a 50-percent reduction in sales tax, ideally to lower costs for consumers while allowing for more business overall. Businesses have to jump through a few hoops first. To participate in the UEZ Program, businesses have to be certified by the program, be in tax compliance, and be registered within one of the 27 designated zones. Interested artists can direct questions to the UEZ office at bayonneuez@baynj.org, or (201) 858-6357; or the Bridge Art Gallery at connect@bridgeartgallery.net, or (201) 443-8921.